Unless you're driving a Bugatti or other supercar, your chances of outrunning the Texas Department of Public Safety's latest highway patrol car are slim-to-none. Not only is itbased on the fastest SRT8 Challenger that Dodge sells, it's also been modified. Did I mention it was donated by Buffalo Bills DE Mario Wlliams and that it has an engine bay covered in skulls? 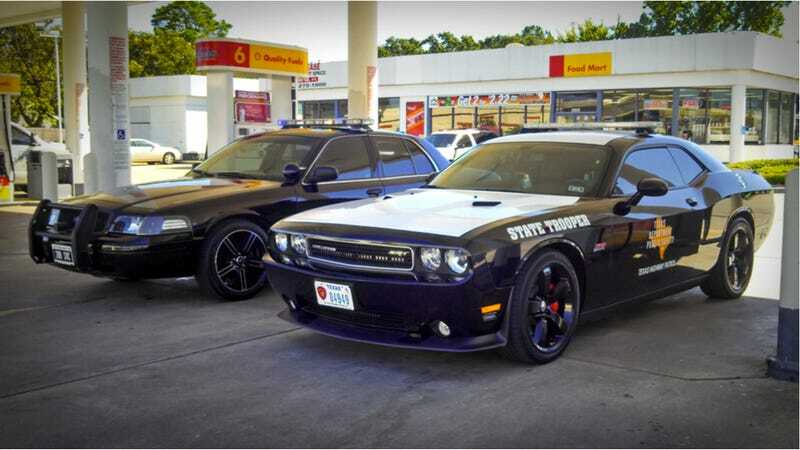 The DPS (Or Dr. Pepper Squad if you're a local) took a Dodge Challenger SRT8 392 with a 6.4-liter HEMI V8 and over 470 horsepower, threw on an AFE Power intake and other unseen modifications, a light bar, and other small details on it to make the most insane DPS car since those old SSP Mustangs from the '80s and early '90s. Did I also mention it has three-pedals? Photos of the car come courtesy from David Wilksover at SecondServiceVehicles (you can see Wilks' mean-looking P71 parked next to the Challenger) who says this was part of a donation that former Texans DE and current Buffalo Bill Mario Williams made to local law enforcement. Mario Williams, it should be mentioned, is a licensed peace officer in Texas, although the school that licensed him was suspended after allegedly letting Williams skate without the normal credentials. Since Williams is most likely going to continue playing football I don't think we have to worry about the Pro Bowler botching an arrest anytime soon and, given how gnarly this Challenger is, I'd guess it's going to be on the high school promotional beat way more than on actual patrol.